VOB is the extension of the files contained in DVD-Video media. VOB files usually contains video, audio, subtitle and menu in stream form. since VOB format is quite popular and maybe every one of us gets various VOB videos. If you have got some VOB files, you may want to burn them to DVD discs so that you can view the movies on DVD player or TV with family and friends or to release hard disk space. In this article, we'll show you how to burn VOB files to DVD for preservation or play on DVD player/TV. To convert VOB videos to DVD on Mac, you need a third party DVD burner for Mac to help you accomplish the task. Here DVD Creator for Mac is highly recommended to help your accomplish the task. With it, you can successfully convert VOB to DVD on Mac with super fast speed and high output quality. Plus, it also can convert other video files such as MP4, MPG, MPEG, 3GP, WMV, ASF, MOV, DAT, FLV and even most HD video formats like MTS, M2TS, TS, etc. to DVD for backup on Mac with ease. If you are using Windows and want to burn VOB files to DVD, you can refer to DVD Creator for Windows. Now free get the Mac DVD burning software and check out the easy steps to convert VOB files to DVD on Mac OS X (including 10.11 El Capitan). This VOB to DVD conversion guide takes the Mac version for example. The way to convert VOB files to DVD in Windows is the same. Please just make sure you've downloaded the right version. Install and run DVD Creator for Mac, and then load VOB files to the program by clicking the "+" button. You can also import videos from iPhone, iTunes and so forth directly from the Media Browser. When the files are loaded, you can rearrange the file list with the up-down arrows. Added videos can be previewed on the left viewing window. You can trim, crop or rotate videos. 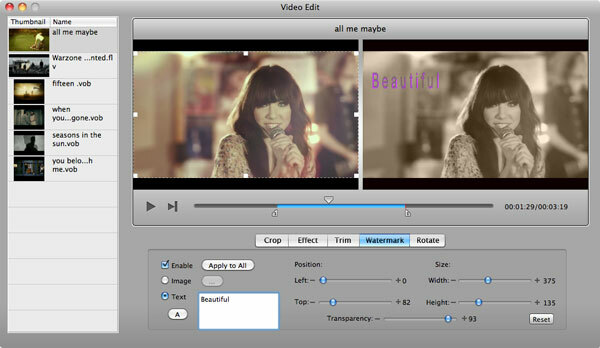 Adding watermarks and adjusting video effects are also available. To get these options, you can click the Edit button onto the video thumbnail to open the Edit box. This Mac DVD Creator also allows you to create your own DVD menu with rich selections of DVD menu templates. Simply click the Menu button to select one and set the Frame, Button and Text to customize your DVD menu. After all the settings, preview the DVD to make sure all is OK and hit Burn to start to burning DVD from VOB files. Or you can simply convert VOB files to DVD folder, .DVDmedia or ISO file on your Mac for later burning. After the burning finishes, you can enjoy watching VOB movies on your TV sets and home DVD players. Here is the video tutorial on converting VOB video files to DVD. Hi, they are not totally the same. There will be watermark on the output video if you use the trial version, and the trial version will expire in 30 days. Is the trail version the same as the registered one? The menu is quite professional, but it would be better if there are more choices. No, it can't. To burn Video_TS to DVD, please turn to Aimersoft DVD Copy or Aimersoft Video Converter Ultimate. Can it burn Video_TS folder to DVD? It’s wonderful that I can burn my VOB files to DVD now. It helps me a lot. Is this guide not cleat enough??? Otherwise, pay attention to the video tutorial. It's very easy to get it done. I'm a Mac newbie and want some more detailed guides on converting VOB to DVD in Mac. Thanks.